NDB ceremoniously opened its 130th ATM at Royal Fernwood Porcelain Ltd., Police Station Road, Kosgama in a bid to expand its automated delivery channels. With this opening the Bank now has a total of 23 offsite Cash Recycle Machines (CRM)/ATMs island-wide. 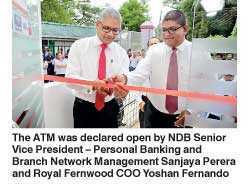 The ATM was declared open by NDB Senior Vice President – Personal Banking and Branch Network Management Sanjaya Perera and Royal Fernwood COO Yoshan Fernando. Customers and residents of Kosgama are now able to conveniently carry out banking transactions such as cash withdrawals, balance inquiries and fund transfers easily and conveniently. NDB has taken considerable strides in the digital arena, bringing the customer’s banking experience to a whole new level that is faster, more secure and convenient to use. Technology is ever evolving and what is invented today would be obsolete tomorrow. Hence keeping up with the current technological advances is critical. NDB is making every effort to think ahead and present customers with the most relevant products and services. The NDB Digital Banking Platform includes the famed NDB Mobile Banking App, NDB Online Banking, and Branchless Banking services. Delivering customer convenience is a key driver at NDB. The Bank is currently in the process of carrying out branch transformations to simplify processes while saving time and cost for customers. Accordingly, NDB has installed Self Service machines at several of its branch locations, with which customers are given the convenience of 24 x 7 deposits and withdrawals. Customers can now avail this 24 hour service at NDB’s Kandy City Center, Pettah, DarmapalaMawatha, NawamMawatha, Pelawatte, Maharagama and Avissawella branches.This service eliminates the need to spend time waiting in queues, and encourages customers to embrace efficient digital banking. In time to come the Bank will enhance the range of services provided to their customers to further ease their banking activities, progressing into new solutions, providing additional value.